Last week we did a giveaway for Milky!, an incredible breastfeeding supplement by Need Brands brought to you by Tia and Tamera Mowry. Congratulations to Krystal Cano of Indiana on winning the 6 day supply of Milky! Enjoy and please let us know if you love it as much as other mommas do! This week we have the pleasure of doing another giveaway for another amazing Need Brands product! We will be giving away 2 bottles of their Stretchy Deep Moisturizing Cream. This cream is one of a kind and it is not just for moms that want to prevent or minimize stretch marks. It is an all natural, organic moisturizer that the entire family can use and benefit from. If you do have stretch marks, Stretchy works to reduce inflammation in the skin by hydrating, moisturizing it and encouraging collagen production to help rebuild connective tissue. After a few weeks of use, you should be able to see a noticeable difference on any stretch marks that you may have had. If you are pregnant and want to prevent getting any stretch marks, Stretchy can help do that by maintaining your skin constantly moisturized to prevent scaring and stretching. Like I said before, though, Stretchy is for everyone. It is an all natural cream that smells amazing and is made of all natural ingredients. 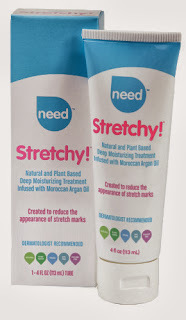 Stretchy is created from a blend of argan oil, cocoa butter, aloe vera, tamanu oil, argan oil, cupuacu butter, horsetail, lady's mantle and vitamins K1 and E. It is also recommended by dermatologists. Many moms love that it is vegan and none of the Need Brand products are tested on animals. So, if you'd love to try Stretchy and win one of two bottles that will be given away, follow the steps below to enter. The more you enter, the more likely you are to win. You have 5 ways to enter and can enter daily by commenting on the blog and tweeting about the giveaway too! Good luck and stay tuned to see if you're the lucky winner! The will be 1 winner selected at random and 1 winner selected who has the most points earned during the giveaway. Earn one point per entry and you can enter 5 times the first day alone. Then you can enter twice each day after that by tweeting about the giveaway and adding a creative comment below. Tell us why you want to win, what creams you have tried, why you love Tia & Tamera.....anything you can think of related to the giveaway, Need Brands, Tia & Tamera or creams in general! Contest begins tonight at midnight (October 4, 2013 at 12 am) and ends October 9, 2013 at 12 am. Get started and win yourself a tube of the best moisturizing treatment around. If you would like to order Stretchy in advance, enter NICK10 at checkout to receive 10% off your entire order of 2 tubes or more. I was not paid/compensated in any way to test/review this product. I was simply given a tube to try and I'm addicted!